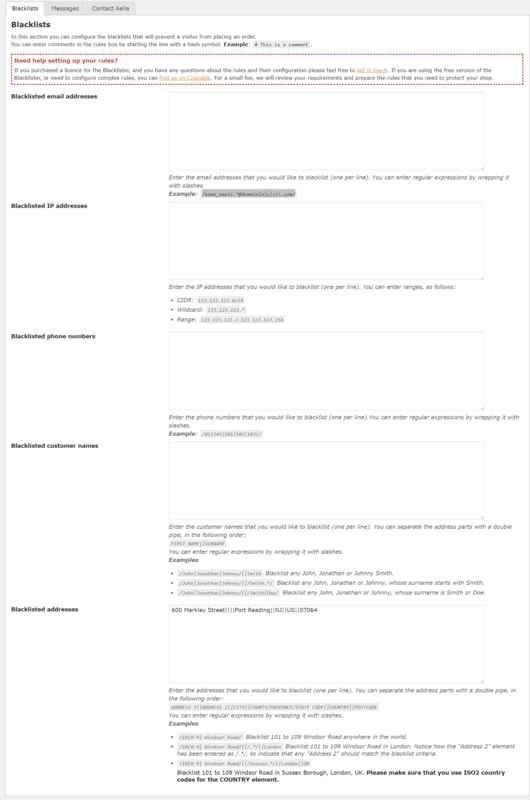 Blacklister for WooCommerce allows WooCommerce to refuse orders from specific visitors, based on customisable blacklisting criteria. 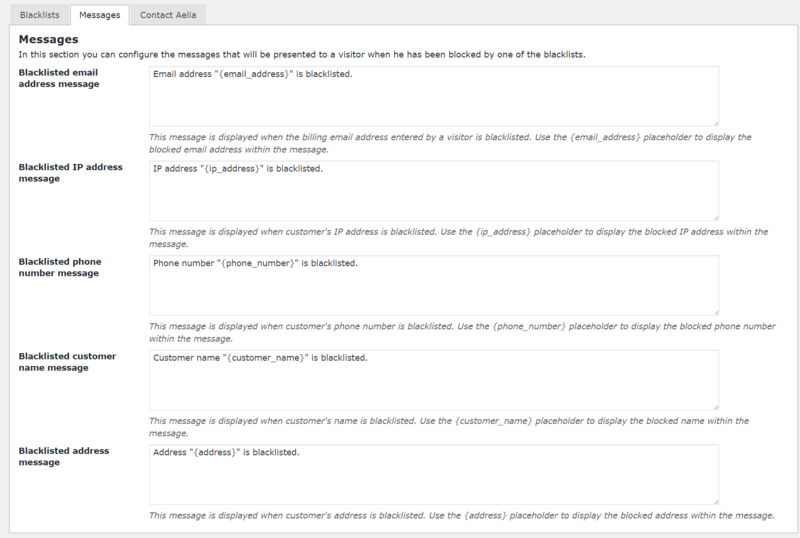 Blacklister for WooCommerce allows your shop to block orders from specific visitors, based on custom blacklisting criteria. This product is the premium version of the original Blacklister plugin developed by Aelia. It includes all the features of the premium plugin, and it’s fully covered by our top class support service. 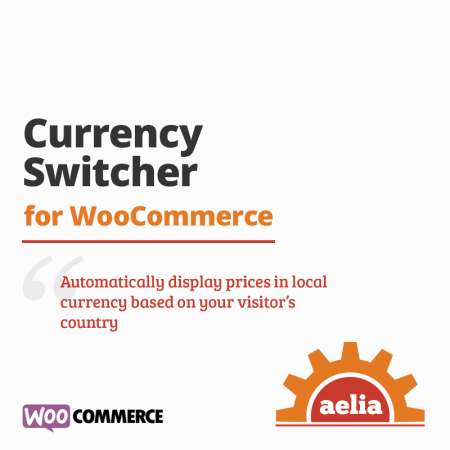 The free version of the plugin is still available, and can be downloaded by clicking on the following link: aelia-woocommerce-blacklister.zip (free version). What are the differences between the premium and the free Blacklister? The premium version of the Blacklister includes access to our support service. This will allow you to contact us through our contact form, or our support portal, and receive a quick answer to any question you might have. The free version doesn’t include support. Premium customers will get priority updates. We will release updates for the plugin for the premium version first, and for the free version at a later stage. We still plan to maintain the free version for several months at least, although it might be updated less frequently. 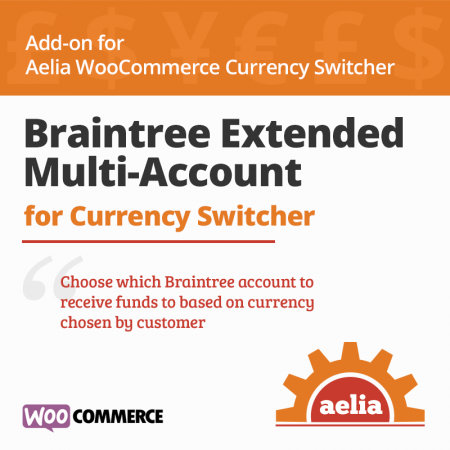 The plugin adds a new menu in WooCommerce backend, where you can specify a list of email addresses or IP addresses that will be blacklisted. When a visitor will try to place an order using one of the blacklisted email or IP addresses, the checkout will be interrupted and the visitor will be notified of the reason why the operation was blocked. Allows to blacklist customer’s name, address, phone number and email addresses, using exact matches or regular expressions. Allows to blacklist IP addresses, using exact matches or IP ranges. Customisable error messages to notify the user why they were not allowed to complete the checkout. We would like to thank Dustin Robinson for the contribution in relation to the blacklisting of phone numbers. Free Aelia Foundation Classes plugin for WooCommerce 1.9.4.170202 or newer (this plugin can install the AFC library automatically). Added logic to handle free and premium versions of the plugin. Improvement - Hooked the plugin to the new auto-updates system. Bug fix - Fixed condition in which some comments were interpreted as blacklist rules. WC 3.0.x Compatibility - Added logic to use $_POST data directly, if WC_Checkout::$posted_data is not accessible. 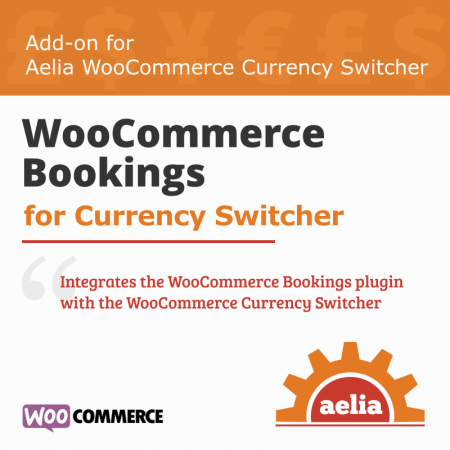 Bug fix - Added workaround to fetch posted data at Checkout in WooCommerce 3.0.6 and later. Bug fix - Fixed logic used to save the custom messages for blacklisted customer names, phone numbers and addresses. Bug fix - Fixed logic to check for blacklisted addresses, to ensure that all address elements match the blacklist rule. Refactored Blacklist_Validator class to use the new methods provided by the WC_Checkout class in WC 3.0. Fixed notice in settings page, due to incorrect format of default settings. The default value for blacklisted email and IP addresses and now an empty string. Fixed minor notices while checking the blacklist rules for customer's address. Improved description of support terms. Added links to contact form and Codeable. Added support for blacklisting of customer addresses. Added support for blacklisting of phone numbers and customer names. Rewritten logic used to render plugin's settings page. Renamed main class to WC_Aelia_Blacklister. Changed text domain to wc-aelia-blacklister. The Blacklister was designed as a simple blacklisting solution, and doesn’t currently track statistics about the validation rules, such as how often a rule matched a customer. If you need such feature, please feel free to get in touch. We can review your requirements and prepare an estimate for the implementation. Thanks. Another 5 star product from Aelia. This plugin works flawlessly on our site to block email domains with a regex pattern. anyway to block billing/shipping addresses? The Blacklister allows to enter rules to block specific addresses. The rules are applied to both billing and shipping address. Thanks for the plugin, really helps us a lot. Could you please add IP v6 Support? The Blacklister logic is generic and can already work with IPv6. The plugin takes the IP address from $_SERVER['HTTP_X_FORWARDED_FOR'] and $_SERVER['REMOTE_ADDR'] globals. If a client is connecting with an IPv6, then that value will be found in those variables. In such case, you will simply have to write the appropriate rules to match IPv6 addresses, and they will be applied automatically. If your site uses a reverse proxy, the actual IP address could be passed using a different variable. You can write your own custom filter for hook wc_aelia_blacklister_visitor_ip to override the IP address received by the Blacklister. It would be great if you can add host names blocking feature. I want to block customers that use IP from VPN services. 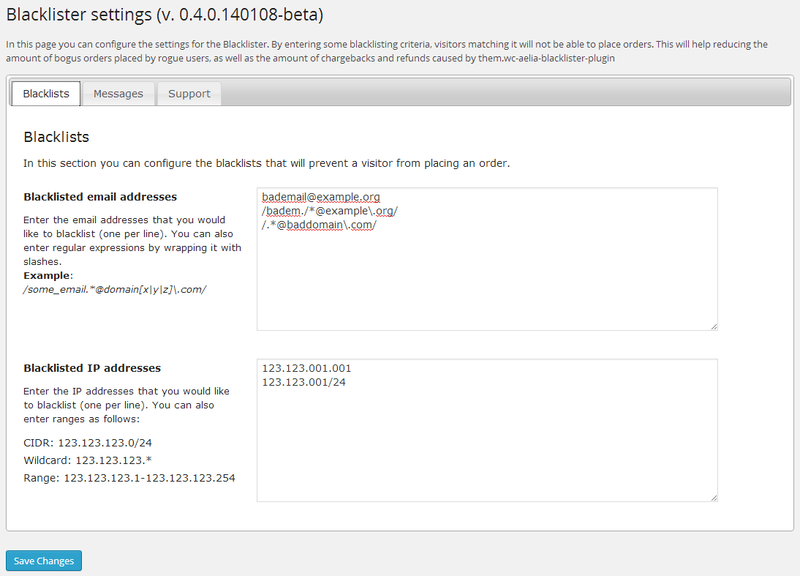 The Blacklister already supports IP address filtering (see screenshot). If you have the IP addresses of the VPN services, simply enter them in the corresponding box (using ranges could be simpler), and they will be blocked. We tried to implement host name filtering, but the reverse IP lookup proved to be slow and unreliable (not every IP address can be accurately resolved to a name). What would be the correct syntax for blocking all email coming from the domain baddomain.com? As indicated in Blacklister settings page, you can use standard regular expressions to match emails from a specific domain. I haven’t tested it, but a simple expression such as /. *@baddomain\.com/i should work. The matching is done using standard regular expressions, processed via the PHP preg_match() function, therefore you can refer to its documentation to produce valid expressions. Simple to install and set up. Does the job nicely. It may be possible. The paypal email address IS passed on to woocommerce and visible through the custom fields on an order. If not possible to “Block”, it could at least be flagged. Thoughts? You’re right, such information may be available. We will have to check how to retrieve it consistently, as different payment plugins may not save it every time. I will ask it to add such feature before the plugin is put on sale. Thanks. This plugin is everything I was looking for. And support was also on point. I was wondering though, it the e-mail on the blacklist would be the paypal e-mail the user is using. Thanks for your feedback, glad that the plugin helped you. Regarding your question, the email address is the one entered as billing address during checkout. It’s not possible to block the checkout based on PayPal email address, as such information is not available (customer enters such detail on PayPal pages and it’s not passed to WooCommerce). Correction (17/05/2014): as pointed out by Robert, the PayPal email address is passed to WooCommerce by some plugins. Even though that information is passed only after the order has been paid, we will be adding some visual indication on orders page to highlight when the PayPal email address is one of the blacklisted ones.